Back in January when I was researching my Nusbaum relatives, I ran into a dead end. My great-great-grandmother Frances Nusbaum had a sister Miriam. Miriam married Gustavus Josephs and had a daughter named Florence born in Philadelphia in 1880. Florence had married Louis Siegel in 1903; Louis was also from Philadelphia and was working as a traveling salesman. I found Louis and Florence on the 1910 US census, but after that, things got fuzzy. Sometime thereafter, Louis must have become ill. He died on September 30, 1915, at the State Hospital for the Insane in Norristown, Pennsylvania. According to his death certificate, he had been ill for three years and had been hospitalized since November 19, 1913. His cause of death was general paralysis of the insane or paresis. He was only 43 years old. Although I only have one document to support this, it appears that in 1913, Florence and Louis had had a child, a daughter Marion. On the 1920 census, Florence Siegel was living with her father Gustavus Josephs and her brother Jean Josephs, both of whom were working at a mill as manufacturers, presumably of fabrics, as discussed in an earlier post. Included in the household was a seven year old girl named Marion Siegel. Although she is described as the daughter of the head of household, it seems apparent that Marion was Florence’s daughter, given her age and her surname. When her father Gustavus died in May 1924, Florence continued to live in the home at 2020 North Park Avenue; she is listed as a dressmaker in the 1925 Philadelphia directory residing at that address. Unfortunately, that is the last document I have for Florence. I cannot find a marriage record or a death record for her, nor can I find any definitive document for her daughter Marion. Despite searching for every Marion with a mother named Florence, I could not find either of them on any document after that 1920 census and the 1925 directory. I was a bit overwhelmed. This could be an incredibly helpful tool, but it meant going back and searching through it for any and all ancestors who were alive in the 1930s when Social Security was enacted and who might have applied for its benefits. That’s a lot of ancestors! But I slowly plodded through, and for the most part, I found either confirmation of what I already knew or a tidbit of information that was interesting on its own, but not terribly helpful in terms of further research. Pennsylvania, Philadelphia Marriage Index, 1885–1951.” Index. FamilySearch, Salt Lake City, Utah, 2009. Philadelphia County Pennsylvania Clerk of the Orphans’ Court. “Pennsylvania, Philadelphia marriage license index, 1885-1951.” Clerk of the Orphans’ Court, Philadelphia, Pennsylvania. 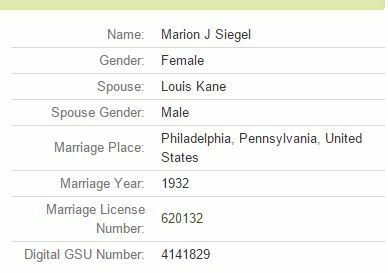 So now I knew that Marion Siegel had married Louis Kane in 1932. Since they were married in Philadelphia, I assumed that they were living there after getting married, but I could not find them at all on the 1940 census in Philadelphia. But then I found a 1952 ship manifest for a cruise from the West Indies to New York with three passengers with the last name Kane: Louis Kane, Marion Kane, and Lois Kane. The ages for Louis and Marion were correct, and Marion’s birthplace in New Jersey was also correct. And they were living at 573 Washington Street in Brookline, Massachusetts—a neighborhood I know well since my daughter once lived right near there as does a close friend from college. 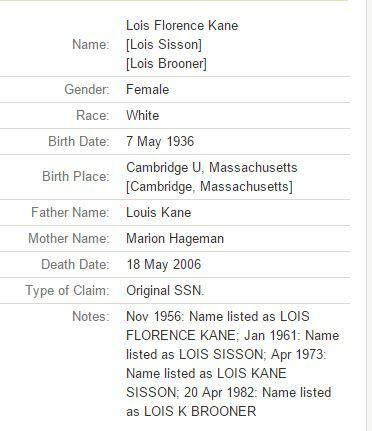 Knowing now that Louis was born in Connecticut and that the family was living in the Boston area, I was able to find a number of additional records for Louis and Marion Kane and their daughter Lois. In 1930, Louis was living with his parents in Newton, Massachusetts, according to the census of that year. Louis was the son of Harry and Jessie Kane, both of whom were born in Connecticut and were the children of Russian immigrants. Harry Kane was the owner of a furniture business, Kane Furniture, which further research revealed later belonged to Louis. It was apparently quite successful, as this article from the April 18, 1954 Boston Herald indicates. By then finding Louis and Marion Kane in several directories and passenger manifests, I learned Louis’ precise birth date, which then led me to the SSDI, where I learned that he had died in October 1963. Unfortunately, I could not find an obituary for him. He was only 53 when he died, and Marion was just 51. What happened to her between 1963 and 1994 when she died? I did not yet know. 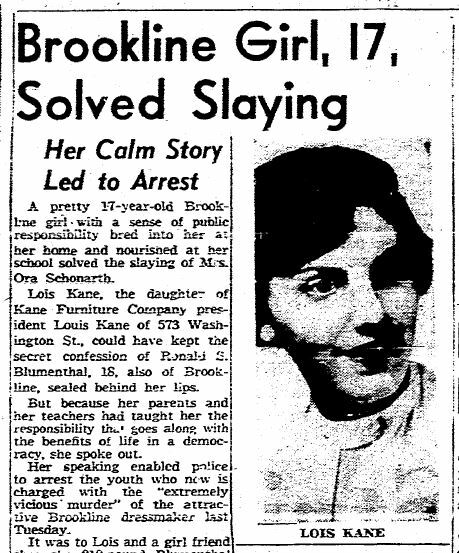 While searching for information about Louis and Marion, I also found an article revealing that their daughter Lois Kane had played an important part in the prosecution of a murder case in Boston in 1954 when she was just a teenager. As described in many newspaper articles, eighteen year old Ronald Blumenthal had committed a brutal murder of 53 year old Ora Schornath in July, 1954; he had beaten, stabbed, and strangled her in her home. 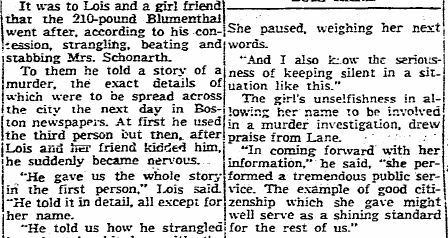 Blumenthal had then described the murder to Lois Kane and another friend, suggesting that he had committed it. When the victim’s body was discovered and the crime was described in the newspapers, Lois realized that Blumenthal’s story could in fact be true. She informed the police, and Blumenthal was arrested. He ultimately confessed and pled guilty to second degree murder on October 1, 1954. He was sentenced to life in prison, but was paroled in 1967, over the objections of Schornath’s brother. I then searched for more information about Lois Kane. I wanted to know what had happened to this courageous young woman. Once again, the SSCAI was a valuable resource. I found this entry. I now had her birth and death dates and locations, and I had two married names, suggesting that she had married twice, once to someone named Sisson and once to someone named Brooner. In the Florida Marriage index, I found a listing for a Lois F. Kane who married H. Michael Sisson in November 1960 in Dade County. 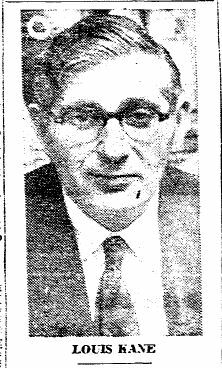 Unfortunately I have had no luck yet finding out anything about Michael Sisson; I cannot find him on any documents that predate or postdate their marriage in 1960. But I will keep looking. Either Michael Sisson died before January 1, 1982, or he and Lois had divorced by then, because on that date Lois Florence Sisson married James C. Brooner in Broward County, Florida. Seeing that Lois’ middle name was Florence confirmed for me that I had the right person, based on the SSACI. I knew from the SSACI that Lois died in 2006, but as with her father Louis, I’ve had no luck finding an obituary. I don’t know what she did after the Blumenthal case or how she ended up in Florida or whether she had children. One thing that bothered me about the entry for Lois on the SSACI was the listing for her mother’s name: Marion Hageman. 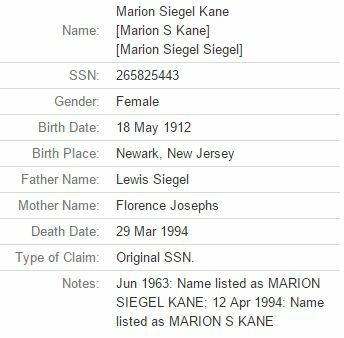 Even though I was reasonably confident that I had the correct Louis, Marion, and Lois Kane, I had to find out why the SSACI listing had Marion’s name as Hageman, not Siegel, which was her birth name. Searching for Marion Hageman answered a number of the unresolved questions. In particular, it told me more about what had happened to Florence Josephs after her first husband Louis Siegel died in 1915. On the 1930 census I found a Marion Hageman listed as the daughter of Ely and Florence Hageman, who were living in Philadelphia, Florence Joseph’s hometown. I was pretty sure that this was Marion and Florence (Josephs) Siegel, given the birth places listed for them and their parents and the ages. It seemed that Florence had married someone named Ely Hageman. I was able to locate a marriage record on the Philadelphia marriage index indicating that Ely Hageman and Florence Siegel had married in 1929. In 1940, Ely and Florence were still living in Philadelphia, where Ely was still working in the furniture business. 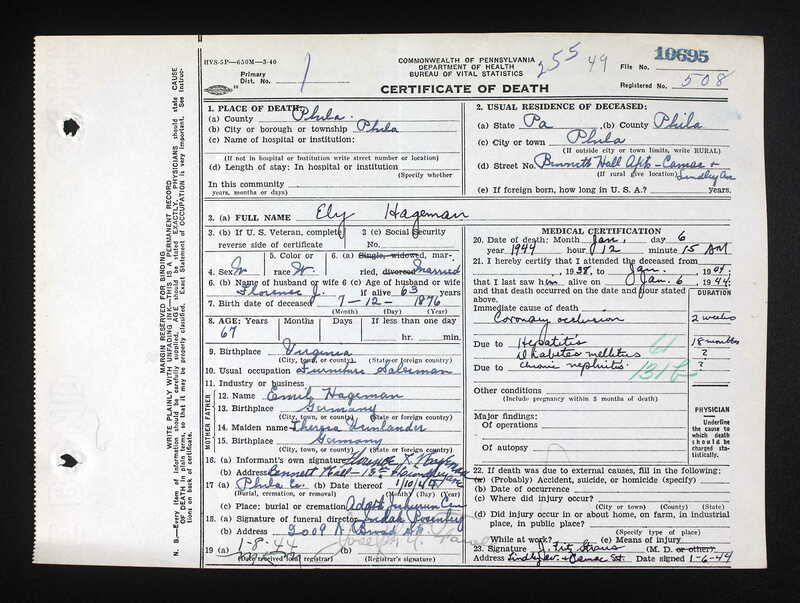 Sadly, four years later Ely died from a coronary occlusion brought on hepatitis and diabetes, according to his death certificate. He was 67 years old. I do not know what happened to Florence after Ely died. She did take a trip with her granddaughter, daughter, and son-in-law in 1953, as this passenger manifest indicates. Ancestry.com. 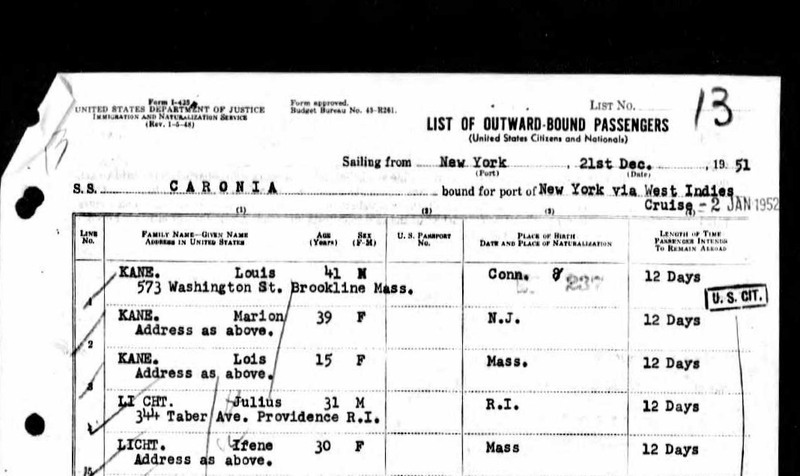 Massachusetts, Passenger and Crew Lists, 1949-1957 [database on-line]. Provo, UT, USA: Ancestry.com Operations, Inc., 2014. But I have not found any record after that indicates what happened to Florence after that. Did she move to Boston to be closer to Marion, her only child, and Lois, her only grandchild? Or did she move to Florida, where her granddaughter Lois had married by 1960 and lived thereafter? I don’t know. Yet. But isn’t it amazing how one new database entry led to so much more information? Thank you, Ancestry, for adding the SSCAI. 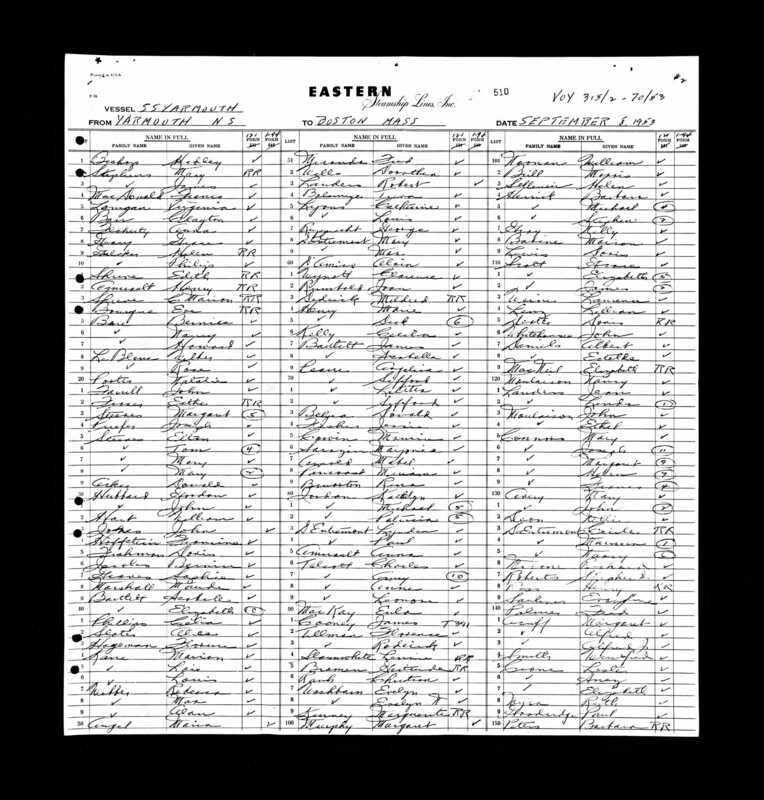 This entry was posted in Genealogy, Nusbaum, Philadelphia and tagged ancestry.com, Boston, Nusbaum, Philadelphia, Ronald Blumenthal, Social Security by Amy. Bookmark the permalink. 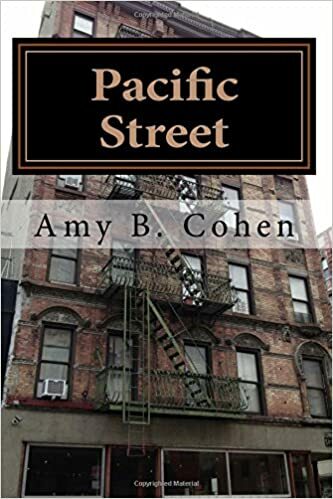 Amy, your persistence and skill at investigative research continue to amaze. I take that as high praise coming from you and knowing your own skills! Thanks, cousin! Here I am mired in the Middle Ages in my genealogy search – now reading this interesting entry I switch to events in the “present”. I was 17 in July 1954, a recent graduate of Belmont High School, working in Cambridge, a reader of the Boston Herald. I don’t remember this case. Well, at 17 most of us are pretty absorbed in friends, music, boys, clothes, etc., not current events. And it was resolved rather quickly—-arrested in late July, guilty plea on October 1. But I bet your parents might remember it. It was all over the Boston papers—I only cited a handful of the articles. And it was also published in papers across the US. Wonderful research Amy! I need to check out that database on Ancestry.com. Thanks, Jana! It really is an incredible resource! Thank you, Jana! I am truly honored and hope others find it helpful.